Andrew Hopkins, Exscientia will be joined by Mark Davies, Vice President, Biomedical Informatics, Benevolent AI, Claus Bendtsen, Executive Director & Head of Quantitative Biology, AstraZeneca, Gisbert Schneider, Professor, Chair for Computer-Assisted Drug Design, ETH Zurich. These expert speakers will all presebt on the new role of artificial intelligence in drug discovery. Visit our website and download the brochure for the full agenda. Alongside the two-day conference, there will be two pre-conference workshops taking place on Tuesday 20th March 2018. The morning session will be led by Nicolas Clare, Technical Project Leader at Axol Bioscience. He will discuss Induced Pluripotent Stem Cell Derived Models and their use in Drug Discovery. 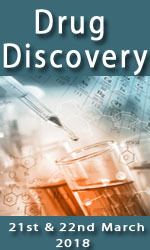 The workshop is aimed at those who would like to understand the revolutionary biological technique of creating induced pluripotent stem cells (Ipsc) from any source material, differentiating them into different cell lineages and their use in drug discovery, either as healthy controls or disease models. The afternoon workshop will be led by Emanuela Cuomo, Associate Principal Scientist at AstraZeneca who will provide an overview of CRISPR/Cas technologies and how they are applied to drug development. Specific examples will illustrate how genome editing is used in AstraZeneca pipeline to improve target identification and validation; also how it can be used to predict drug resistance and direct drug optimisation.